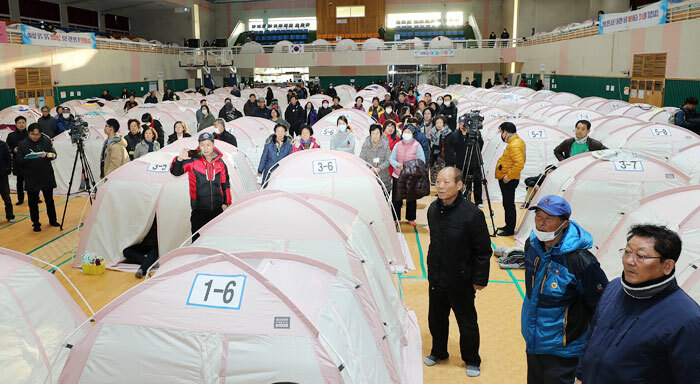 A gymnasium in Pohang, North Gyeongsang Province has served as a makeshift shelter for some 400 locals after their homes were damaged in a 5.4-magnitude earthquake on Nov. 15 last year. Friday marks the 100th day since the quake, and the region has suffered another 97 aftershocks of varying strength. Even as the country is focused on the Winter Olympics in Pyeongchang, Pohang remains gripped by fear of the next big tremor. Hundreds locals fled the southeastern port after the biggest aftershock was felt there on Feb. 11. The main expressway was crowded with more than 5,000 cars between 5 to 6 a.m. on that day, seven times more than on a normal day. One taxi driver in his 60s said, "Seismologists say an even bigger quake is on its way so I'm wondering if I should stay here." According to Hong Tae-kyung at Yonsei University, energy has built up in the region between Gyeongju and Pohang following earthquakes there, "so there is a chance of an even bigger earthquake happening." Hundreds of residents in Pohang's northern township of Heunghae, which was the epicenter of the earthquake, have left. According to city officials, the population of Heunghae has dropped from 34,181 in October last year to 33,523, accounting for most of the exodus. Fear has become part of life in Heunghae. Most of the aftershocks have been less than two in magnitude, which is too feeble for most people to notice. But locals say that is enough to send them packing. Kim Mi-young (36) said she is made nervous even by the vibration of her smartphone or the rumble of a passing truck. "I leave the door open even when I'm in the bathroom, because I'm afraid of another earthquake," she said. "My husband and I are discussing whether to move to a safer location." Some residents are already making plans to move to the homes of relatives elsewhere. One 47-year-old housewife there said, "The fear of another earthquake is worse than the quake itself." More than 10,000 locals have sought counseling at hospitals in the city.